Nearly two-thirds (63%) of rural Americans say they have a broadband internet connection at home, up from about a third (35%) in 2007, according to a Pew Research Center survey conducted in fall 2016. 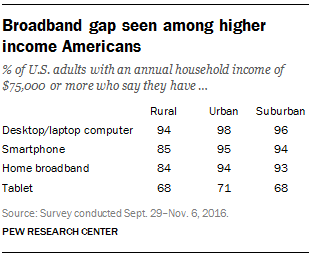 Rural Americans are now 10 percentage points less likely than Americans overall to have home broadband; in 2007, there was a 16-point gap between rural Americans (35%) and all U.S. adults (51%) on this question. 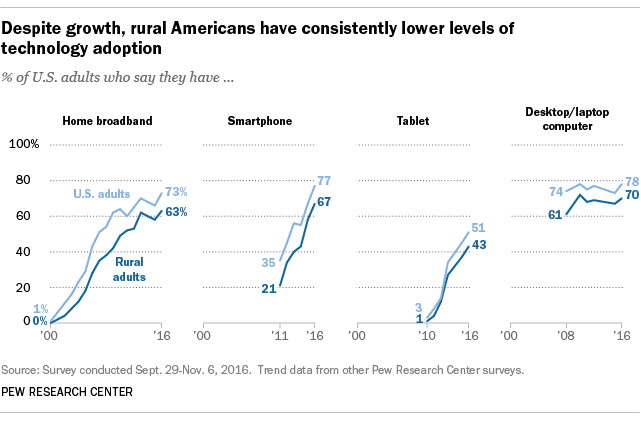 Mobile technology use among rural adults has also risen rapidly, with the share of those owning smartphones and tablets increasing sharply. Ownership of desktop or laptop computers, by contrast, has only slightly risen since 2008. Rural residents also go online less frequently than their urban and suburban counterparts. 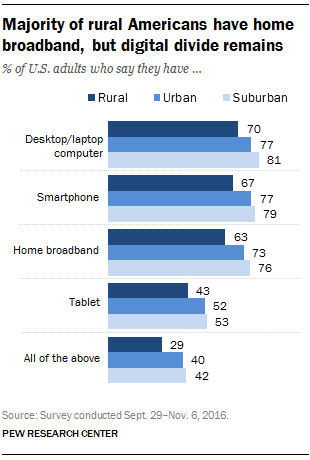 Roughly six-in-ten adults (58%) who live in rural communities say they use the internet on at least a daily basis, compared with more than three-quarters of those in urban (80%) or suburban (76%) areas. Meanwhile, roughly one-in-five rural adults (19%) say they never go online, compared with 11% of those who live in urban communities and 10% of those who live in the suburbs. As is true of the population as a whole, financially well-off rural residents have high levels of technology adoption: 84% of rural residents living in households earning $75,000 or more a year say they have broadband internet services at home, and 85% own a smartphone. However, smartphone and broadband penetration exceeds 90% among higher-income residents of urban and suburban areas. These comparably low levels of adoption among even high-income rural residents may be due to a unique feature of rural life. Even though rural areas are more wired today than in the past, substantial segments of rural America still lack the infrastructure needed for high-speed internet, and what access these areas do have tends to be slower than that of nonrural areas. The Federal Communications Commission recently announced the formation of a Rural Broadband Auctions Task Force to serve unconnected areas and expand mobile coverage to the rural communities in the U.S. Despite lower levels of technology ownership and use, only 36% of rural adults say that the government should provide subsidies to help low-income Americans purchase high-speed home internet service, compared with 50% of urban residents and 43% of suburbanites, according to a recent Pew Research Center survey . Note: Rural residents are identified in our phone surveys by using the ZIP codes of respondents and matching them to federal Office of Management and Budget classifications for those who live outside metropolitan and suburban areas.